The visual language of colonial heritage embodied in the architecture or mundane ornaments of our lives is often unnoticed. Perhaps it is because we rarely view these relics as anecdotes of foreign imperialism on a day-to-day basis or perhaps because colonialism is seen by the masses as the arena of archeological and academic studies. 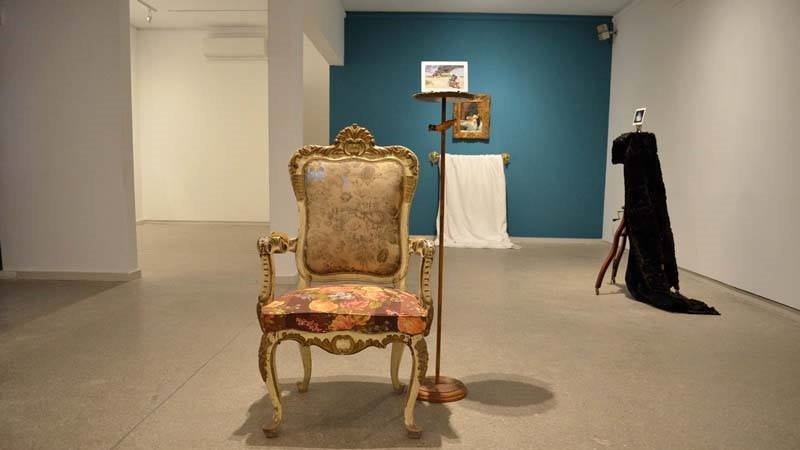 At Canvas Gallery in Karachi, viewers were reminded by Risham Syed’s exhibition that orientalism is not just a professed theory for research and analysis but is also a synthesis which we find all over the world, and not just in Pakistan. Risham Syed’s accomplishments include not only a list of acclaimed exhibitions and awards – the artist’s oeuvre has been acknowledged frequently internationally – but her work continues to evolve with time and ventures onto unusual routes. ‘Kaal Pakhan (Blackbirding)’ is a collection of works which are entities of expression and narratives but at the same time respond to the gallery space and the section of society who visits the shows. ‘Kaal Pakhan’ elucidates the schemes in which people, in particular people of colour, were tricked, captured and shipped off to work as slaves in inhumane conditions. Risham Syed has transfused this metaphorical title of her exhibition to display visual reminders of how entrenched the colonial regime is in our lives; for example an antique chair with an all-too-familiar floral baroque seat covering. A statement piece of furniture often overlooked, as is a vintage camera tripod, or the cobalt blue and white Chinese painted crockery or the copper and gold dramatic frames; these are objects which are prominently found in upper-middle-class Pakistani homes. Syed further accentuates this feeling of romantic foreign luxury with a heavy, soft white towel on a gleaming handle; it flows casually yet suggestively onto the galley floor underneath a close up of the painting, Great Bath at Bursa. 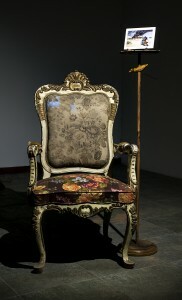 This installed piece is titled History as Past and it is a critical reflection of the artist’s understanding of how European artists and traders eroticized the entire continents of Asia and Africa as sensual utopias, which were translated and depicted in paintings such as the Great Bath at Bursa. The Kaal Pakhan quilt is also interesting in a similar way because the artist uses and adapts images to highlight the contradictory perspectives we have in our society. The marigolds with the ‘do not pick flowers’ sign could be an overt connection of the ‘picking’ of slaves out off their home country. A second picture, of the Quaid-e-Azam Library in Lahore in its archaic structural aura alongside a typical image of a fair-skinned European gentleman with a navy coat and a powdered face, insinuates at the legacy of the Quaid as man who lived an English lifestyle. Over the soft cushiony quilt hangs a gleaming flashy motif which bears a resemblance to the Saudi Arabian sign of Arabian palm trees and knives. This seems to be a suggestion that the current cultural impression the masses of Pakistan are following and the transformation from one foreign influence to another, highlighting the deficits and lacunas we face when it comes our identities as Pakistanis. The colours Risham Syed infuses into the exhibition release not only a sensual experience, with the rich chocolaty hues of the dark oak, burgundy and brass furniture but recall the desperately recreated ‘antique’ and ‘vintage’ heritage items in homes. Combined with the flashy gold of the Saudi empire, the little details such as the porcelain skin of the odalisque in the Great Bath painting against the positively charcoal body of her male companion solicit our perspective as did many European artists and merchants which was emphasized in Edward Said’s Orientalist studies. In terms of colour, viewers notice the gleaming oil paint shine in the 6 paintings of ……But the Whole Truth. A depiction of a romantic sunset by the Eiffel Tower in Paris painted by Chinese painters in an impressionistic style is something perhaps a few people would point out as ‘commercial art’. Yet Syed highlights and questions this bizarre irony because Paris and The Louvre – or for that matter, all European art – is and has been considered a worldwide phenomenon in highly achieved artistic practices. Yet even an unnamed Chinese street artist, or for Pakistanis, a portrait sketcher outside Zainab Market, can recreate these foreign landscapes by en masse and there will always be people who profess it to be a gorgeous artifact. 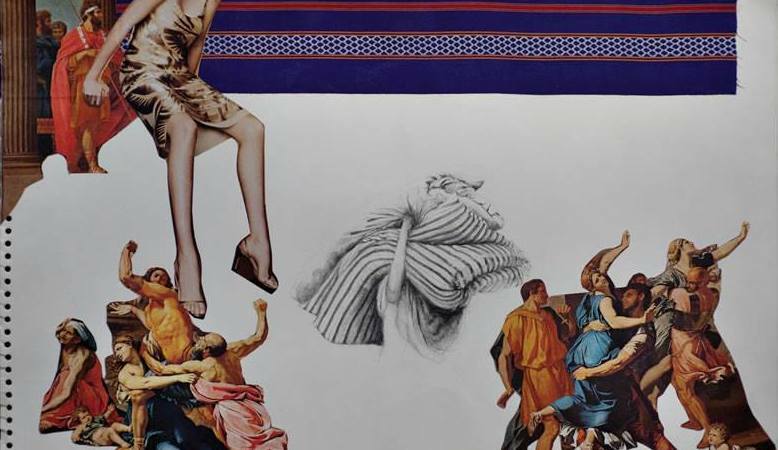 The four Untitled series, which look like they have been torn from an artist sketchbook, narrate a collage of images through history which can be interpreted in a multiple ways, as can all of the Kaal Pakhan show. However, the concept of a seemingly rough amalgamation of personified compositions such as scattered docile cattle bowing while they graze to a foreign military man is very successful because of the incomplete look the piece has. They provide a contrasting compliment to the grandeur and opulence of the other installations. Provided that the viewer has to read the artist’s little notes next to the pieces, it is not difficult to understand the rhythm of the work. It is interesting to see how such global themes such as orientalism can be personalized and contextualized within a Pakistani perspective and how we find ourselves (sometimes a bit guiltily) in the artists’ work. 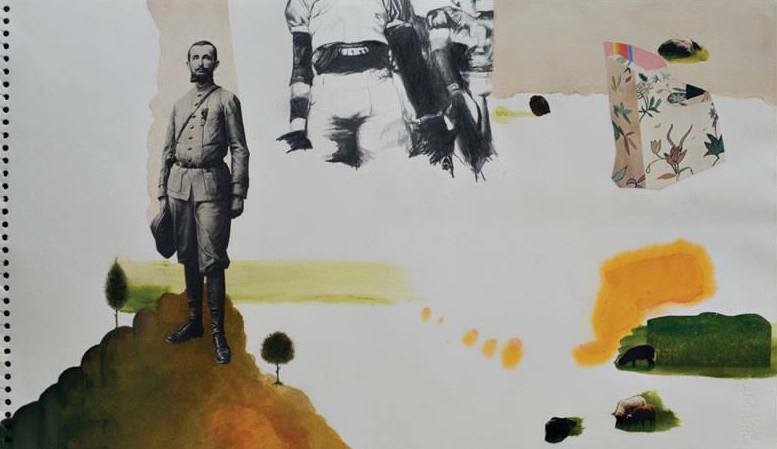 ‘Risham Syed: Kaal Pakhan (Blackbirding)’ was on view at Canvas Gallery, Karachi, from 2-11 December. All images courtesy of Canvas Gallery. Veera Rustomji is a Fine Art student at the Indus Valley School of Art and Architecture. She has been a freelance writer for the past two years and enjoys conducting research within the field of art. This page truly has all the information and facts I wanted concerning this subject and didn?t know who to ask. you ! So nice off you to take the tiome to watchh our article and comment >Please kerep watching and let us know if you would like a specific reading .|Thank you ! !|Thank you!! 3|meow~ (=^･ω･^=)|LOL ME TOO I LUUUUUUUUUUUUUUUUUUUUUUUUUUUUUUUUUUUUUUUUV CATS|my cat has 1 eye. it ssaadd|me too I am cat lover|awwwwwwwwww, that’s so cute!|Are you somehow relasted to Sebasstian in black butler? have two pett cats, thhe black one named Moonlight, the second one is named Ginger i love them so much. ME!|GEEZZ!! TAKE MY FREAKING CAT!!!!!! PLZZZ!! !btw i loved it!|I’m A CAT LOVER TOO!!!! yours is the greatest I’ve came upon so far.